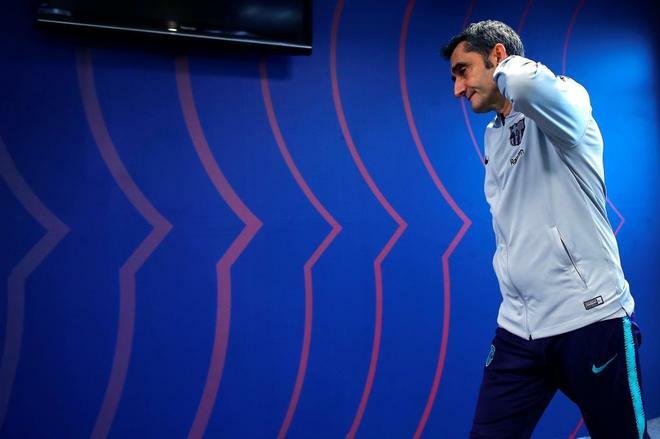 Valverde: "Neymar has not called me"
The coach of FC Barcelona, ​​Ernesto Valverde, has ensured that as long as the market remains open, it is possible that a striker could "come" who can "adapt"
The coach of FC Barcelona, ​​Ernesto Valverde, has ensured that while the market remains open it is possible that "some" striker "can adapt quickly" to cover the absence of Munir El Haddadi , and has warned of the danger of duel this Sunday at the Camp Nou against Eibar (18.30 hours), a team that has "a very clear identity" and that always tries to "take the game to your field." "We have to value it, with the departure of Munir we have a space, also with Rafinha's injury, Aleñá is a more midfielder profile, the market is open and we will see if any player can come, taking into account the economic conditions". He said at a press conference, where he explained that what he would value is that it "can adapt quickly." In case you can not incorporate anyone, the "solutions" will look for them at home. "The market is open, there are some specific conditions and until we finish the market we will value it, currently I will find the solutions within the team, " he said. Among them, he ruled out that he talked about Neymar's return. "Neymar is a great world-class player who was with us and who is now on another team, I guarantee that no one has called me, news is emerging during the year, but he is a Paris Saint-Germain player. the player and PSG, "he said. On the other hand, it played down the status of Philippe Coutinho. "Throughout the season there are games in which you are more fortunate and others in which less." It was not a good match on our part, Coutinho has played great games with us and we hope he will continue to do so. good things that Philippe does, he has many good things and we have to try to take advantage of them.The match has to help us to take a step forward, "he said. Even so, he has not considered positioning the Brazilian of false nine. "We would have to think about some solutions, I do not know to what extent it could be, until now I had not considered it," he said, before discussing his compatibility in the field with Ousmane Dembélé . "They can play together, at certain times it can be, I try to play with some balance, if I review games, they played together in Milan against Inter and against PSV," he recalled. In addition, the Basque coach said he will not renounce to resort to the quarry. "What you have to do with the players below is to have patience, there has been a relegation and the team has changed a lot, the normal thing is that the players cost them and they go in little by little, this is not a matter of one day "he said. On Sunday's rival, he warned of the danger of falling into his game. "Eibar has a very clear identity, very marked by Mendilibar, and it's something that works wonders for him, he plays with conviction , they're going to come and press us up, to try to prevent us from overcoming his pressure, to take the match to his home ground. , to force us to hit long and avoid thefts in their own field.It is the team that steals more balls in the opposite field.We must be aware that they play with risk and we must try to take advantage of it, "he insisted. However, it played down the supposed difficulty they have in playing against teams that form with three centers. "We have also won teams that played with three centers, it has nothing to do with the scheme, I attribute it more to situations in which we have not gone well in the matches," he said. Valverde also praised Marc Cucurella , on loan from the Barça club and who will face on Sunday. "He's doing a good season and it's good news, he deserves it, it's good for Eibar and for us too, he started playing little left-back and he's settling in, and he's playing great games. We have to keep in mind that for all players of the B to pass through the hands of Mendilibar always helps, because it tightens and makes the players better.It is a player from the quarry and could come back, "he said. In another vein, consider that the purchase of Andorra does not distract the central Gerard Piqué from his work with the team. "I value it very positively, it's a great season, far from thinking that it distracts you, these things focus you even more ... The players have the wisdom that they do not care about too many things, and Piqué is active and does different things. that there are many other players who have other concerns, "he said. Finally, Valverde valued the possibility that Leo Messi can soon mark his goal 400 in LaLiga. "400 goals is a spectacular figure, beyond the reach of practically everyone in this room, we hope it falls as soon as possible, they are numbers destined only for a player," he concluded.